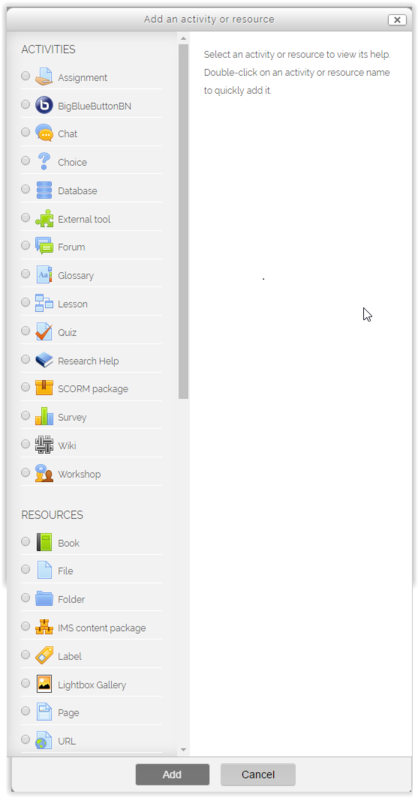 Moodle Activities & Resources are tools or features in a Moodle course that allows for measurable and collaborative interaction between teachers and students. * Contact the Faculty Technology Center for SCORM SUPPORT. Navigating the CAS Interface 1. Log into myLSU . 2. On the left hand side panel, select Student Services | CAS Online Tutoring. CAS Online Tutoring Settings: The CAS Online Tutoring offers a variety of settings that are changeable in order to give the users different looks and functions. General Settings: You can change the name of the activity and the preconfigured tool. The Launch/cartridge URL function will be unavailable. To Utilize the Drag and Drop Method: 1. Login to Moodle and select a course. 2. Turn editing on by clicking the Edit button at the top right corner of the page. Adding the Analytics Graphs Block to a Moodle Page( for Instructors Using regular Moodle 3): 1. Open the Moodle page for the course for which you need to add the Analytics Graphs block. Click the green Edit button in the top right corner.